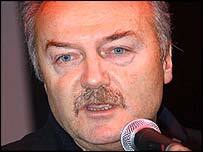 George Galloway has denied "fawning" over Saddam Hussein as he continued his libel battle with the Daily Telegraph. The MP said he saw the ex-Iraqi leaders as a "bestial dictator" and his pre-war visit to Iraq had been aimed at getting him to readmit weapons inspectors. 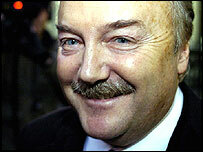 Mr Galloway has gone to the High Court in London over claims he took £375,000 from Saddam's regime. The newspaper is standing by its right to publish the story, which it says was based on authentic papers. There were heated exchanges on Tuesday as Mr Galloway was cross examined by the Daily Telegraph's QC, James Price. The court watched a video of the MP telling Saddam Hussein in 1994: "I salute your courage, your strength, your indefatigability." But he told the court the clip had been taken out of context and he had been referring to the Iraqi people in general, not specifically to their leader. He said he always made clear he believed Saddam had presided over a brutal regime. Mr Galloway strenuously denies claims made in the Daily Telegraph. Mr Price asked whether it had been necessary to tell the Iraqi leader many families were naming their new-born sons after him. "It could be said to be a fair description - that you were fawning on the president," he said. The MP replied: "No, it was just a salient fact." He added: "Perhaps it's a measure of the failure of the policies supported by your client that people all over the world are doing so." Mr Galloway was also tackled about an article he wrote for the Mail on Sunday describing his meeting with Saddam in 2002, before the start of the war. In the article, Mr Galloway described the Iraqi leader's "gentle" handshake, how he was "glancing shyly downwards" and "surprisingly diffident", said Mr Price. He had also recounted how the Iraqi leader had offered the MP Quality Street chocolates and told him anecdotes about Winston Churchill. Mr Price said people were entitled to think from the article that Mr Galloway was an apologist for the Iraqi regime. "You appear to be presenting a rather charming shy man and no mention of the fact that you regarded him as one of the most brutal people in the world." Mr Galloway countered that he had presented exactly what he found, even if it was not what the Daily Telegraph liked. "I was trying to stop a disastrous war. I wanted to convey the feeling of the Iraqi people - that they should extend an olive branch to Great Britain," he said. "I had spent many years trying to do that. That's why I asked Saddam to allow the weapons inspectors back in." He said numerous speeches, articles and interviews showed he was no apologist for Saddam Hussein. Mr Galloway also challenged the QC's suggestion that 5,000 had been killed immediately and 12,000 died later in the Iraqi regime's chemical attack on the Kurdish city of Halabja in 1988. Mr Price: "Are you defending Saddam Hussein over Halabja Mr Galloway?" "How dare you," the MP replied angrily. Mr Galloway said the Daily Telegraph "hated everything that I believed about the Middle East". The court was shown a letter by Mr Galloway saying two of Israeli Prime Minister Ariel Sharon's "most vociferous supporters" were the newspaper's former owner, Conrad Black, and his wife, Barbara Amiel,. The Telegraph's case rests on a defence that it was in the public interest and responsible journalism to publish secret Iraqi papers found in Baghdad, including those about Mr Galloway. The MP says he does not believe the documents are genuine. But Telegraph foreign correspondent David Blair described how he had found the papers inside the Iraqi foreign ministry. They included a five-page memorandum from the head of Iraqi intelligence which Mr Blair thought "had the makings of a major story about Mr Galloway's links with Saddam Hussein's regime". Explaining why he thought it was genuine, he said it would have been an "extraordinarily elaborate exercise" for anybody to have forged the document. "Then of course such a person would have had to hope that someone might chance upon this document from the thousands of pages in the many hundreds of folders within the hundreds of filing-boxes in the room - even if they happened upon the room at all - and that it would find its way to a journalist," he said.